A sick dog vomiting can be caused by something as simple as food disagreeing with the dog or a stomach virus or by a more serious underlying illness. Most dog owners are sensitive enough to their pets to pick up on when their dog is not feeling up to par. Sick dog symptoms include sleeping a lot, not engaging in normal activities, vomiting, diarrhea, whimpering, or the dog not eating or drinking. Sick dog vomiting and diarrhea can sometimes be relieved by giving the dog Pepto Bismol! That’s right; some medications that we humans use are also helpful for our pets. Before you use Pepto Bismol for dogs or any other human over the counter medication, make a call to your veterinarian. 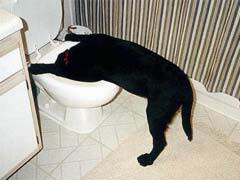 Every 4 to 6 hours, you can give the dog 1 teaspoon or ¼ tablet of Pepto Bismol for each 20 pounds of weight to stop sick dog vomiting. Some Pepto Bismol side effect can lead to change of color of bowel movements, inconclusive urine tests, and darkening of the tongue. If you notice your sick dog vomiting and the return of diarrhea when you stop using the Pepto Bismol, it is time to take the dog in for an examination to diagnose underlying health conditions. If you see one or more round lesions on your dog that are hairless, with the center part becoming scaly, you might think that your sick dog also has ringworm. Ringworm is not a worm at all! Ringworm is caused by a fungus. Ringworm in dogs is contagious. It can be passed easily from dog to dog and even from dogs to humans. A veterinarian diagnoses ringworm by examining the scales. If the diagnosis is ringworm, then the doctor will prescribe an antifungal medication that is applied to the skin or one that is taken by mouth.